The Features of New Apple Watch Series 4 are amazing. These new features make it a great product in the market. As always, Apple is genius in creativity and this time again, The Apple shows its amazing creativity. The New Features of Apple Watch Series 4 will force to buy this watch if you can afford the price of this watch. The Apple Watch Series 4 has only and only one disadvantage that is its price. The Price of this watch is very high. The price of The Apple Watch Series 4 starts from Rs. 40,900/- for its 40mm variant in India and $399 in The USA. Actually, the price varies with the more specifications country to country. 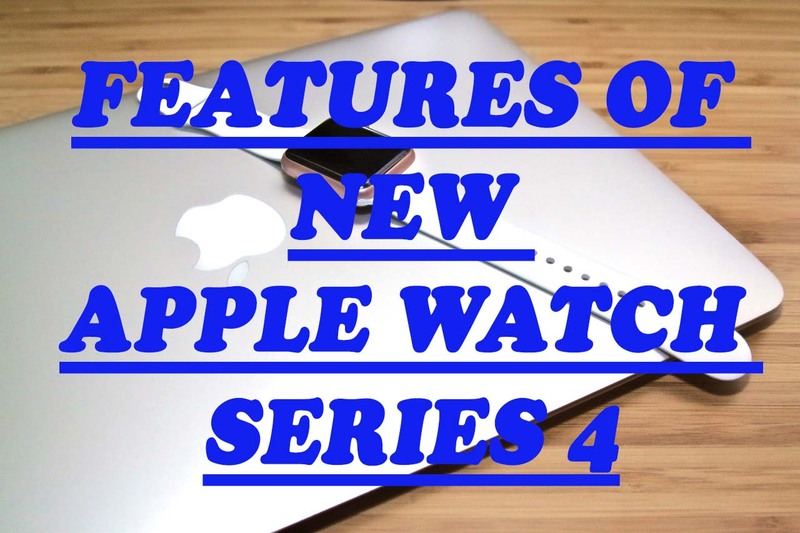 Now we will see THE BEST FEATURES OF NEW APPLE WATCH SERIES 4 in detail. 1. ELECTROCARDIOGRAM (ECG) APP: This is the most amazing features of the new Apple watch series 4. Now, the Apple watch can do the ECG just with a click of the button in minutes. Any person can easily create cardio of its heart by putting one finger at the digital crown and the rest will do by the watch itself. The ECG will be created in a few minutes. Actually, the digital crown has some electrodes and an optical heart sensor at the back of the watch. These components help the watch to create electrocardiogram of a person in a few minutes. This new technology can be a game changer in the market for the apple because now we do not need many pieces of equipment to create ECG of our heart. 2. Fall Detection: The Apple watch can detect your fall detection in a few seconds with its new technology accelerometer and gyroscope. This feature allows you to make an emergency call or dismiss the alert of an emergency call. But if you are unconscious for 60 seconds, then this will automatically place an emergency call and message with the location to the contacts mention in the medical id. 3. A louder Speaker: This watch comes with a loudspeaker. This speaker is 50% louder than the previous version. Moreover, the previous version has the problem of echo, but this version has solved the problem by separating the microphone and speaker in opposite to each other. 4. Faster Processor: This version of Apple's Watch is 2 times faster than the older version because it has the S4 chip installed. This is a very fast chip because of the complete system in package. The apple called it SiP (System in Package) where all the components are fabricated on a single component. With this processor, the apps will load faster and the performance of the system will boost. 5. LTE support: This Apple watch has 4G support which will allow you to make calls, text, and stream music without the user's cell phone connected to the watch. 6. Monitor Heart Rate: Apple Watch Series 4 can monitor the heart rate. This watch alerts the user when the heart rate is very low or high. Sometimes, we can recognize the serious conditions, but this watch can do this. If this watch finds any irregularities in the heart rate then it alerts the user and the user can immediately consult the doctor. 7. Three Rings: The Apple Watch 4 has 3 rings Move, Exercise, and Stand which tracks your activities whole day. Move Ring: It calculated the burned calories of the user by its movement. Exercise Ring: This ring tells the user about its exercise activities of the whole day. It counts the fast pace moving also an exercise. Stand Ring: This ring calculated the standing time of the user in a day and alerts the user to stand up for some time to be healthy in the future. 8. Largest Display: This Apple watch provides the largest display by narrowing the border. The Apple did not increase the size too much, but it increases the size of the display by narrowing the border. Apple claims that the display size has been increased by 30% and the watch is thinner. Apple has re-designed the whole interface which looks more beautiful now. This is a great achievement of the apple because the larger display is more loved by the user. 9. Air Quality Index and Other Stuff: The apple watch provides information about the air quality where the user is living. It tells its user about the clean air index on the screen which is very good for the user to take a decision where he should live or not. It also tells about the weather forecast, The Sunrise/set, Solar Earth, UVI index and World Clock etc. 10. Battery: The Apple Company claims that the user needs to charge the battery for a single time for the whole day. So, the battery backup of this watch is very good. Apple is an amazing company whose founder, Steve Jobs, was also a great person. Apple is different from other companies in the market and their products are also different. They always make awesome products with the best performance. In short, the Apple Watch Series 4 is a great product. If you have a good budget then you should buy this product because this product will give you amazing satisfaction. .i.e. This product is a worth buying product. If you like the article please comment below and if you have any kind of suggestion for me, then please comment.